I just finished this painting a couple of days ago. 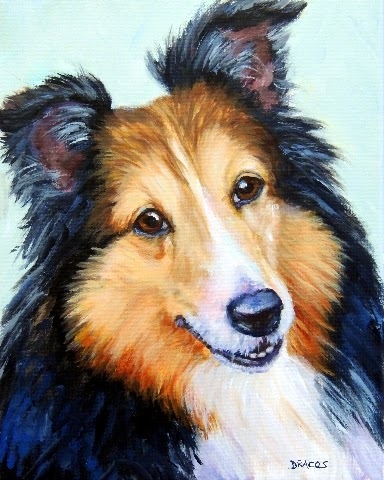 It's a beautiful tri-colored rough-coated collie, and the original, an 11x14x3/4" acrylic painting on stretched canvas, is still available. Also, the original of the cav that I listed yesterday is available, too, and it's the same size as this painting. Both are in my Etsy shop, along with prints. Lately, I have been given a fairly large number of photos from a loyal customer, and I plan to paint as many as I can after the holidays. Many of them are some of the most adorable goats I have ever seen. I can't wait to get started! But my family members come first during this holiday season. We celebrated the fifth birthday yesterday, in fact, of my little precious granddaughter (my only grandchild! ), and we did it in as grand a birthday style as we possibly could because, being a close-to-Christmas birthday person, her birthday often gets passed over in all the busy-ness of the holiday season. Oh, and a happy birthday on the same day to her Aunt Eileen, too! 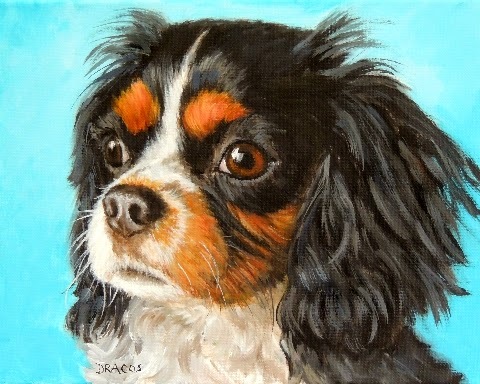 This is a tricolored cavalier King Charles spaniel painting I finished recently. I'm quite happy with it -- another painting I've done fairly recently that makes me happy. Sometimes for me painting is such a struggle, and sometimes, such as lately, it's become a pleasure. I wish the pleasurable days outnumbered the difficult ones!